When studying complex social-political processes, situations and trends, the hardest part of the analysis are predicting what is yet to happen. The usual procedure in such cases is to point out the closest possible variants (scenarios) for the development of events. However, the scenarios elaborated by analysts hardly ever materialize. There is a countless number of factors and of theoretically possible variants in social reality. That is why prognostic scenarios primarily represent attempts at outlining hypothetically possible situations linked to some most probable combination of currently operative factors. Reality can never be grasped beforehand in the version that will actually be realized. Of the hundreds of theoretically defined possibilities, only one will occur in reality. Hence, to list scenarios is part of the analysis of the phenomenon, event, process. In this article, we will focus on the first scenario out of four possible ones (Scenario Two, Scenario Three, and Scenario Four). Our main goal, however, is to use the scenario tools in order to “describe” a hypothetically possible development of the Russia-Ukraine crisis in the context of the relations between the Kremlin and the Western liberal democracies. But the geostrategic focus of study will remain the same: the Ukraine-Russia crisis represents an attempt to redefine strategic relations a quarter of a century after the end of the Cold War. 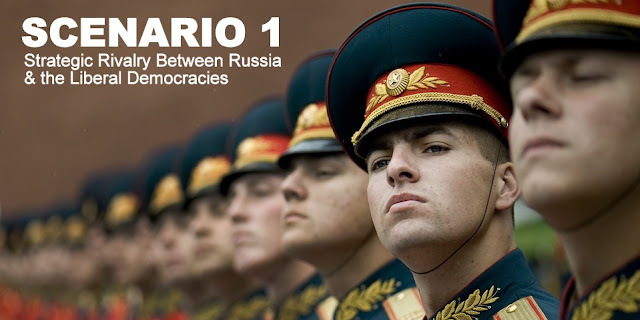 Scenario 1: Intensification of the strategic rivalry between Russia and the liberal democracies. An attempt to change the world order (balance) at the start of the 21st century. “The world is full of contradictions today… Sadly, there is no guarantee and no certainty that the current system of global and regional security is able to protect us from upheavals. This system has become seriously weakened, fragmented and deformed. It is my conviction that we could not take this mechanism of checks and balances that we built over the last decades, sometimes with such effort and difficulty, and simply tear it apart without building anything in its place. Otherwise, we would be left with no instruments other than brute force. What we needed to do was to carry out a rational reconstruction and adapt it the new realities in the system of international relations. But the United States has declared itself the winner of the Cold War, saw no need for this. Instead of establishing a new balance of power, essential for maintaining order and stability, they took steps that threw the system into sharp and deep imbalance (my italics, R.K.). The so-called ‘victors’ in the Cold War had decided to pressure events and reshape the world to suit their own needs and interests” (, p. 2). I quoted this long passage from President Putin’s speech as it demonstrates what was indicated in the above analysis of the geopolitical trends, namely, that the Russian political elite is striving for a new balance of power on the world stage. The Kremlin is ever more insistently showing it is not content with the position and influence Russia has in the world after the end of the Cold War. In the narrow sense, this implies a revision of the global geostrategic framework that resulted from the end of the Cold War, the disintegration of the Soviet Union in 1990-1991, and the dismantlement of the Warsaw Pact. What follows from the unfolding of such a strategy in the short term and long term perspective? Foremost, there will be an emphasis on increasing the military power of the country, isolation from the West, attempts at breaking down the unity of the West, an intensive search for approaches to the reintegration of the old strategic allies from Soviet times, the engagement of new allies, etc. Is there any proof of the presence of such elements in Russian policy? In the last 15 years, Russia sharply increased its military budget. From 16.5 billion dollars in the last year of Boris Yeltsin’s presidency (1999), it grew to 84.7 billion in 2013. The military industrial complex of the country was restored, and today, new systems of arms are being created intensively, the main emphasis being on strategic offensive nuclear arms. Moscow also plans to sharply increase (several times over) the country’s strategic atomic submarine fleet. Confrontation with the Western democracies is growing, and Russia is attempting to destabilize them wherever possible, by whatever means. And finally, in 2011, in a speech likewise full of anti-Western rhetoric, President Putin proposed the idea of creating the so-called Eurasian Union, the geopolitical goal of which is to integrate the republics, and even some of the former satellite countries of the Soviet Union, under the leadership of Russia in the context of the new geopolitical realities. This program is not a momentary response to the current situation but represents a long-term strategic project. The Russian president is not hiding the fact that the project has been conceived as an alternative to Western liberal democracy. How will the U.S. and EU behave if this scenario is realized and continued in the middle term and long term? There are two possible options.The first of these we might call a breakdown of Western strategic and political unity, and even a distancing of Europe from the U.S. at a certain stage. This option is realistic not only in view of the Russian strategy described above but also because the integration of the Ukrainian economy will not be a quick or easy process. Today, Ukraine is not prepared for membership in EU or in NATO. Its accession to Europe an Union will be a long and difficult process both for the Ukrainians and for the European economy; in any case, it will be very costly in economic and political terms. The development of international policy under this option will certainly deal a heavy blow to international relations. But would such a development be beneficial for Russia itself? It is almost impossible to give an affirmative answer to this question. Whatever the Russian political elite might believe, such a development in world politics would hardly create the balance in world politics that President Putin is thinking about in his speeches and actions in recent years. On the contrary, this trend would create new misbalances and asymmetries between the states and will generate instability and even greater insecurity, including, or especially, for Russia. For instance, in such a situation, could Russia become a world leader or considerably increase its influence in the world? Such a goal is almost illusory in terms of its practical feasibility. The GNP of the EU, for instance, is about 19.1 trillion US dollars. The GNP of Russia is within the range of 2.08 - 2.1 trillion U.S. dollars. The annual GNP of China is about 9.1 trillion US dollars. How could a state with the financial-economic indicators of Russia become a world leader amidst economic giants like the EU, U.S., China? Even the boldest optimists regarding Russia’s future could not conceive this happening. And nor can the Russian political elite and the leader in the Kremlin. Then what is the point of the confrontation between the developed West and Russia in the context of which their mutual mistrust will keep on growing? The second option under this scenario can be designated as putting increasing pressure on Russia, including financial, economic, diplomatic, and international pressure, restricting the country’s positions on the international markets, global economics, world policy. In other words, if the Kremlin focuses its attention on the idea of changing the world order that was established after the Cold War, then Europe and the US have a second option: maintaining their strategic unity and simultaneously following the policy of exerting pressure on Russia. In fact, after the events in Ukraine and the annexation of Crimea, no one―neither the UN, nor SCO (Shanghai Cooperation Organisation), nor anyone else―can stop these two processes: the consolidation of the North Atlantic Alliance and Washington’s endeavor to increase its superiority over the Kremlin and Washington in the sphere of high tech systems of defense and security, such as the well-known U.S. Global Missile Defense; perfecting the elements of the Prompt Global Strike Doctrine, etc. These are systems that, as Russian experts themselves assess, Russia will not be able to build before 2025-2030. This option, like the first one, will hardly produce greater security and stability in the world. In assessing the first scenario, we must point out that it has many similarities to the development of the world after the end of World War II. The end of that war set the beginning of an intense global geopolitical conflict that arose under the guise of an implacable ideological struggle between Capitalism and Communism. The end of the Cold War created hopes that the conflict had ended. This proved to be illusory, for in the last more than two decades a geopolitical regrouping occurred which started a new geopolitical conflict, of which we are now experiencing the initial phase. This conflict is no longer between Communism and Capitalism; now it is presented as a confrontation between the spiritual values of Russian traditionalism and conservatism on one hand and Western liberalism on the other. Why does this formulation of the conflict only mask the underlying issue? The true issue of the confrontation is geopolitical control over Eurasia, presented as rivalry for influence over the so-called post-Soviet space. Control over Central Asia will increase Moscow’s chances of integrating the post-Soviet space. Dominance over Central Asia will increase the possibilities of the US and Japan to balance out the growing might of China. Like any geopolitical conflict, this one will continue for decades. If this is true, then clearly, in the coming years we may expect the Kremlin to continue its attempts to destabilize Ukraine, and we may predict growing tension between the liberal democracies and Russia.